Not many people have heard of John Rushworth or William Clarke not to mention Henry Elsynge, yet these men were crucial, as Mercurius Politicus argues, to the development of the English Civil War. The reasons he gives are entirely apt- concentrating on the kind of politics that David Starkey has made us so aware of in the Tudor court- the politics of access, the kind of politics in which individuals like Dr Butts and Sir Anthony Denny thrived on in the Henrician regime. Also important is the point he makes about information- I think in a sense we can see something of that operating, particularly with Clarke. Clarke is an interesting figure- he produced the Clarke Papers- a set of manuscripts which contained notes of the council of the army, letters to and from the army high command and letters to and from the army command in Scotland, not to mention copies of newspapers and circulars sent from London and pamphlets too. One of the interesting things about Clarke's collection is the gaps: you look at the account of the Putney debates and there are significant moments, particularly towards the end of the debate, where Clarke just stopped taking notes. There are even moments during days, where he seems to have laid down his pen and ceased to note a particular passage. Of course we can never know what was said then, but neither could men after the event and given the importance that all politicians have for the record of what they said and did not say, one wonders why Clarke stopped recording. Governing the history of a series of exchanges or the way that they are publically disclosed often is the same thing as governing what was said and done at the time: I agree with Mercurius we should put Clarke and Rushworth back at the centre of our histories. Eamon Duffy's Voices of Morebath is an account of events in one village during the English Reformation, running from the 1520s to the 1570s. Duffy has been able to recreate the world of Morebath thanks to its priest, Sir (the honorific is a traditional one) Christopher Trychay. Trychay maintained over the years a set of parish accounts for the village- these accounts spanned the work of several wardens of the various parish funds set up to aid the church. Duffy mentions the young maids' fund, the young mans' fund, the wardens' fund, the ales' fund and others- not to mention bequests that came in and various particular charges that Trychay and the village elders asked the villagers for. Furthermore behind these funds were the wealthy men of the parish- the four men- and the contributions received from bequests- all these were meticulously recorded as lastly were those things that the money was spent on, whether through the discretion of the parish or of the priest. These accounts are accompanied though by Trychay's own moralising- for example he is as keen to report those that have not contributed as those that have contributed, as keen to exhort his flock to communal worship and to the exhibition of their devoted worship as he is to discuss with them what the results of that have been. When in the late 1540s, he finally acquires a black velvet gown to officiate at funerals in, we feel his glee, for the search for funds had been running for over twenty years before that point. Trychay's accounts cover a crucial period of English history and Duffy uses them for that purpose. Between 1520 and 1573, England went through a series of religious revolutions. Henry VIII declared the royal supremacy and abolished the nearby monastery. His son Edward VI engineered a Protestant reformation. Edward was followed by his half sister Mary who returned England to the faith of Rome, and she was followed in turn by her half sister Elizabeth who returned England to the faith of Protestantism. During a dizzying period between 1545 and 1560, the country had to contend with four different religious settlements. This produced confusion inside the local churches of England- the fabric of the church let alone the doctrine was altered again and again with images of saints being replaced with bibles and bibles replaced with images of saints. Duffy implies that the richness of the medieval church was destroyed, its material splendour which, in his view, bound the community together, ransacked. Trychay would agree and his voice tells us on behalf of the parishioners of Morebath of the sadness of secreting the images of saints away and replacing them with the dullness of Protestant ecclesiology. Duffy's book is an elegy for Catholic England. The reign of Elizabeth is greeted by a particular poignant passage, as Duffy writes of the moment when the queen ascended to the throne and for the last time in English history the bells rang out and the congregation prayed in Latin for the safety of the Queen's grace. That elegy comes through the hands of Trychay himself, who by the time he died in 1574, saw a new generation arise who had no memories of the time when England was securely Catholic, when he had arrived in the parish in 1520. We have to remember here though that what we have through Duffy's book is Trychay's view of his parish- we do not know what the views of the parishioners were and whether they felt so elegiac. Particularly we do not hear the voices, save through the priest's ventriloquism, of those that objected to his idea of Morebath. The village sent five men to the rebellion of 1549 which convulsed south western England but as Duffy points out with regard to the rebellion of 1554 in East Anglia, Tudor rebellions were motivated by a large amount of causes- including religion but not only including religion. There are though interesting things to be taken from Duffy's book. The first being that the change from Catholic to Protestant was a change in material culture within a church as much as in doctrine: Trychay himself ended his life happily preaching Protestant doctrine and there is no evidence in Duffy's study of any particular doctrinal attachment amongst the parishioners either way. The second is the degree of community coercion that early modern Christianity exercised in local communities- Trychay read out the accounts with the lists of people who had not contributed for a reason. Frequently justice was meted out by local arbitration- the Sydenham family were crucial in this respect in Morebath and that relied on community consensus. Thirdly its worth understanding how important loyalty to the crown was- apart from the rebellion of 1549- there is no particular instance of disloyalty in the village under any of the reigns we see chronicled here. Lastly there is the frequent importance- growing importance- irrespective of religious faction- of the church and parish as a unit of administration and particularly as a unit for taxation. Henry, Edward, Mary and Elizabeth all requested that Morebath supply them with money, with cash to finance wars and government. Duffy's book is a fascinating slice of Tudor life- its conclusions are to be treated with caution because of the limitations of the evidence that it uses- but having said that they are still interesting and important. Sir Christopher Trychay's character- wordy, cantakerous and traditionalist- comes out strongly through the book as do some fascinating insights into the world of Tudor Christianity (the prominence for example of selling ale as a means of funding the Church surprised me!) Whatever the limitations of the evidence, Duffy has delivered a study which does reawake a little corner of the past. Did Kennedy want to invade Vietnam? What did Johnson believe about Martin Luther King? Was Nixon a crook? What did Blair make of Bush? All those questions to some extent or another have been answered for posterity by tapes- by recordings taken at the time of Presidents and Prime Ministers, their aides and acolytes and even enemies talking to each other. 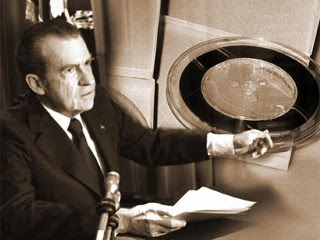 Tapes therefore have become the stuff of political history- most famously of course in the case of Nixon the stuff both of politics and history. On Andrew Sullivan's blog, someone raises the point that apparantly various statements on the Nixon tapes have been rewritten in official records. I have not listened to the relevant sections of the tape- but I am sure that there will be things in those tapes that over time we come to realise were not what people at the time or closer to the time believed them to be. We are overhearing conversations and one of the points about overheard conversations is that they tend to be misheard- chinese whispers is a game based on mishearing and I am sure that there is a lot of that in history using audio as there is misreading in history using text. To take an example, Eamon Duffy made a very interesting discovery when he suggested that a manuscript whose first editor had read the words 'sent Denys ys camp' actually read 'sent Davids ys camp'- surprising it may seem to readers but the first set of words is innocuous, the second a confession of treason. We should expect over time and as people study the tapes more produced by the powerful for mishearings to be corrected or adjusted and for interpretations to change: the scepticism on Sullivan's blog notwithstanding, audio sources just like written sources are open to interpretation and controversy not only to discover the importance of what they say, but also to discover what they actually do say. I just came across a new blog, the Early Modern Intelligencer, its run by a friend of mine, Karen Baston and gives updates on the world of Early Modern history, seminars, conferences etc. Its supposed to be for the Early Modern History Society at Birkbeck College, University of London but its got a wider interest than that- and I think it is a crucial information resource for anyone interested in the period (incidentally they have a conference on Saturday this week which I will definitely be going to and I think would be interesting to most readers of this blog with all sorts of papers from the fascinating (Early Modern Demonology) to the enticing (Revolution and Evolution in Medicine) to the exciting (the Funeral rites of Louis XV). I'll be there and will try and provide an update as soon as the event is over! I reccomend it and the blog. Throughout the twenties and thirties of the last century, a monster ruled Chicago. Al Capone was a brutal murderer and convinced criminal- so much so that though the films of his day pointed to him they (like for instance Scarface) did not directly mention him. Only after his death were films made about him himself. Such was the late 50s' Capone, starring Rod Steiger. The film is a drama based on real events- most of them, save for a romantic moment, actually happened in Capone's life. A journalist was shot who had links to the mob, the Valentine's Day massacre happened, Capone got his break when an associate retired and the wars of the gangsters of the south side and north side did happen. The film, as is common with gangster films of a similar date, is narrated by a police officer who supplies the moral vision that the Capone character lacks and a kind of ironic wit, commenting knowingly on the end to which Capone is sure to come. The film's accuracy influenced the portrait of Capone as performed by Steiger- he based his portrait on reading newspaper articles and books about the gangster- by attempting to ask the question what did Capone want, and attempting the answer through his performance. And what a performance? The point of this film is the performance by Mr Steiger. All the other characters throw themselves onto and off Mr Capone and express various attributes of him or his life. Ultimately he is the centre of the film- the heart of darkness in the modern urban landscape and that darkness spreads, as the character Howard Hughes puts it in the film Nixon, to find the other darknesses. Steiger's Capone is charismatic- when he is on the screen he seems physically bigger than any other character- his vast flabby face fills the screen with a coarse jocularity and careful intelligence. His muscled stomach and arms are instruments that he manipulates with bravery and thuggery, without scruple or hesitation from the first moment he dives upon the task at hand- whether it is bloodying a rival and filling his face with sand or constructing (that ultimate metaphor of gangster movies) a criminal business in Chicago. But what is it all about, what is it all for? Mr Steiger's performance is powerful but what is its point. When we consider Capone I think we need to consider a couple of things. Firstly Steiger's Capone is a man who likes the good things of life- he likes opera, beautiful women and power. He likes to give orders, likes to give them in style. Secondly he is loyal- ultimately this is a man whose loyalty to his boss is paramount and, though he is willing to councel disloyalty, he himself is not disloyal to his life long patron. Thirdly he desires to be somebody- it is not nothing to say that Capone in the film is a man with desires to be admired, to be seen to be someone. Steiger's performance also plays off what is effective about Capone- he is craftier and cleverer than the gangsters he opposes, the cheerful O'Banion, the morose Malone, those who wish to give up, those who don't wish to even start in the business. In a sense he exploits a world in which the costs of gangsterism have risen but also the gains have risen: he brings brutality and reward to that kind of life. The film is clearly a film of condemnation- Capone is condemned. And because of that it cannot show us too much of his charisma- but it works in that it offers a brief view of the personal tyranny of the super gangster- the tyranny that turns Sejanus into Tiberius, Capone from the whisperer beside the throne into the man upon it. The fact that Capone cannot stay on that throne disproves Andrew Marvell- the same arts that gained it are not those that maintain it- but the argument of the film is about the unstable world of the new corporate crime. As everyone battles to the top, literally, and the world looks increasingly like a baronial court in the French middle ages, a man like Capone is the ultimate success and the ultimate failure. He rises so high that he illustrates how low he can fall.